The church is the people and my church family suddenly became Christ for me. Christ is in our love for each other and that is where we must seek - not in the sky or in apocalyptic movies or even in the feast of the Incarnation itself - that most joyful of all places - No, we who seek Christ will most find him in each other. Last Sunday I began with one of my husband’s stories about finding Christ in the water of Baptism and took that a step further by asking you to remember to find Christ also in the other great sacrament of the Eucharistic meal. Today I want to tell you one of my own stories and invite you to find Christ in each other. We are faced, as I told you four weeks ago, with another apocalyptic gospel reading. During this transitory time of a new Christian year we dig through more lectionary readings about the end times. In the coming weeks, there are yet more lessons on being prepared for the coming of the Lord, though not in such dramatic descriptions as today’s image of the world going completely dark and Jesus riding down from the heavens on a cloud to separate the “elect.” That sort of image leaves us speechless. We are never quite sure if we are on the list. We would rather not think about such supernatural and cataclysmic end of the world stuff. This is my fifth Sunday as your Interim Rector and I wonder if by now you have picked up on some themes in my preaching. One theme is that I tend to point out things in the readings of the day that cause us to feel uncomfortable. The point of this is not so that I can then comfort you, though there is a great deal of comfort in the scriptures. No, I’m inviting us to face those things about the scriptures that we don’t like so that we can grapple with them. It is a practice in truth telling. So often I hear folks say things like, “I don’t like that parable” or “I don’t like what Jesus said there,” or something similar. This is as if to say, “I don’t think the Bible should have put it that way.” As if we, each individual who encounters the Bible is called by God to re-write it. I think we need to look seriously at this trend. Instead, let’s courageously look hard at those parts of the Bible we may want to disagree with. And this does, of course, take some study about the context both by way of translation and of historically and politically what was going on when Jesus and Paul and others taught the things they taught in these writing but also the historical references the New Testament writers were making to the Hebrew Bible and the history of the Jews. If you don’t take all of that into consideration, then your interpretation might be a bit short sighted. Once we get past the pageant and lessons and carols we’ll have the opportunity to set a steady course and enjoy the unfolding of the Christian narrative by keeping up with the lectionary readings through the coming months. And the readings we seem to skip on Advent 3 and those you may miss on Advent 4 will be at least read on Christmas 1 when we do lessons and carols. It is one of a particular memory of mine from the time of innocence and freedom of childhood. It was late summer. We were at a church camp, I think for a Saturday of games and picnicking. It was probably a parish retreat. I can’t remember the details, but I remember an experience I had one evening that has stayed with me for life (as lessons learned through experience are apt to do). We were finishing up our day and were playing one last game. It may have been Tag, or our more elaborate favorite, Fox and Hounds, or some new game, I don’t remember, but there was a “get ready, get set, go” called and a group of about 12 children took off running across a small meadow and scattered into the woods. It was a sparse grove of tall hardwoods that seemed to have spilled out of a thicker forest beyond. I took the lead ahead of my two best friends. We were strategizing and giggling as we ran. I was pushing myself to run as fast as I could, probably trying to beat the boys to whatever the goal was, when it happened. I stopped cold and realized that dusk is much darker in the woods than in the meadow I had just run from. I was suddenly afraid to go on and turned to tell my friends but they were gone. It was as if they had vanished into thin air. I guess they found the ball, or whatever the goal of the game was or the game had ended, and they had returned to the meadow. But I was left behind. I could see no one. In fact, I was very much alone in the dark woods. I could hear voices in the distance, but they seemed miles away. I stood there frozen, aware only of my panting breath and the touch of a cool evening breeze from the river nearby. All I had to do was follow the voices back to our camp where my mother would hug me and my father would carry me to the car. All I had to do was follow the still laughing voices of my siblings and friends. But for that brief moment, I was lost in the dark. And I knew it. And I realized how easy it would be to get lost for good and not have such an easy way finding home. This memory is from a time when church and community were clear. It was clear who I was, to whom I belonged and where home was. It was clear what our values were and what the schedule was with regular school-year holidays, work times, family times, and church times. But that has all changed since I was a child. We live in chaotic times with changing values where we have come to value things like fluidity and pluarlity. I’m coming to understand this. That value of individual rights and freedoms. I’m learning that individual expression is not necessarily immorality. But it’s hard to face all these changes. Many of us, those of a certain age, long for simpler times, like our parents did and likely their parents before them. Each generation seems to be hurled into more and more challenges. When I was in college, I spent a summer working as a singing waitress. Really. We took turns, in between serving tables, to sing a song in the next room where guests would gather after their meal. For one of those weeks we had “Christmas in July” and did a big Christmas variety show, the likes of which no one had seen since Bing Crosby and Danny Kaye. I was asked to perform a song from the hit musical Mame. It was that part of the story when the stock market crashed and the whole cast was downtrodden. That would have been late October of 1929 and in this musical they sang a snappy number called “We need a little Christmas!” and they, and I, flounced all around the set smiling and dancing. Apparently we’ve been pushing the joy of Christmas back toward mid-October ever since. It’s no wonder. We need the joy of Christmas desperately in this world. That is why God sent us the only Son, the savior, the messiah. And that’s what all the celebrating is about. What’s not to love about that?! 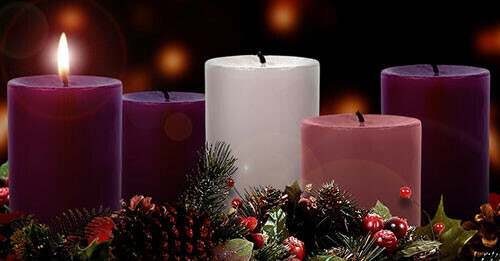 Still, we miss the opportunity that comes with Advent. In Advent we wait and practice a contemplative time of recognizing our call to live into our longing for God’s redeeming presence, to the sorrow that is not sentiment but repentance, and to expectation with all it’s juicy, appetizing, wakefulness of pre-meal excitement. If we skip over that moment of hunger, the meal loses it’s magic. When I turned from that darkening forest as a child and found my way back to the fold of the family that was at that time my church, I experienced for a magical moment what longing and gratitude are worth. And I learned that the church is not a building or even our rituals, doctrines and traditions. The church is the people and my church family suddenly became Christ for me. Christ is in our love for each other and that is where we must seek - not in the sky or in apocalyptic movies or even in the feast of the Incarnation itself - that most joyful of all places - No, we who seek Christ will most find him in each other. My hope for us this season of Advent is that we can find and even broaden the time we spend on such matters as prayer and wonder. We don’t like to talk about the end times and we struggle to find the meaning in images of Jesus riding back to us on the clouds, but we will be richer by far if we just take a moment to ponder these great mysteries and lean into the beyond for just a moment before we run back home.